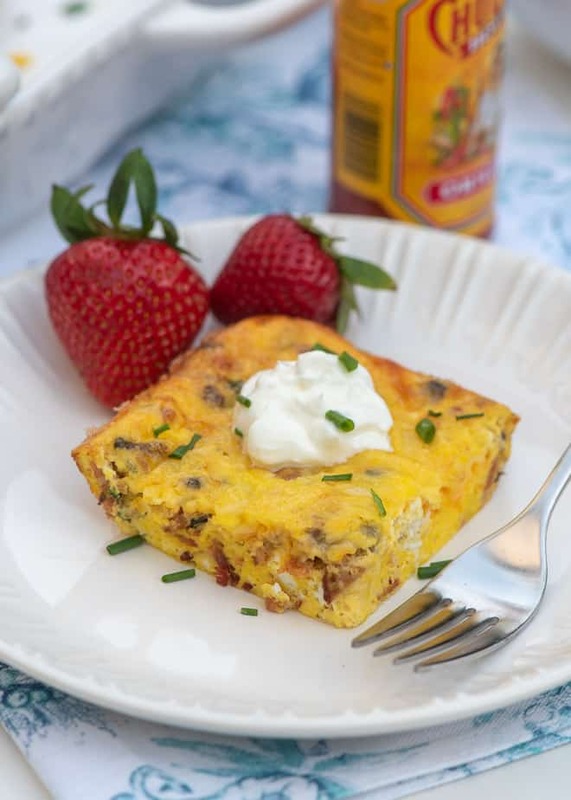 This Easy Crustless Quiche Bake is a fabulous choice for a brunch buffet. It is assembled in minutes and can be prepared a day in advance for a stress-free holiday menu. While I always put out a pretty nice spread for our Easter dinner, I just love planning our brunch menu. I’ve always looked at it as my opportunity to play a little in my kitchen and come up with some new offerings each year. 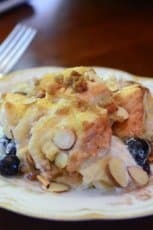 Some of the recipes that appeal to me most are those that can be prepared quickly and easily and it’s a big bonus if they can be done a day in advance. 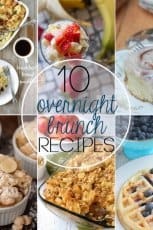 This is especially important with brunch items because it allows for a few more precious moments of sleep before your event. That is, if your little ones somehow magically sleep in on Easter morning! 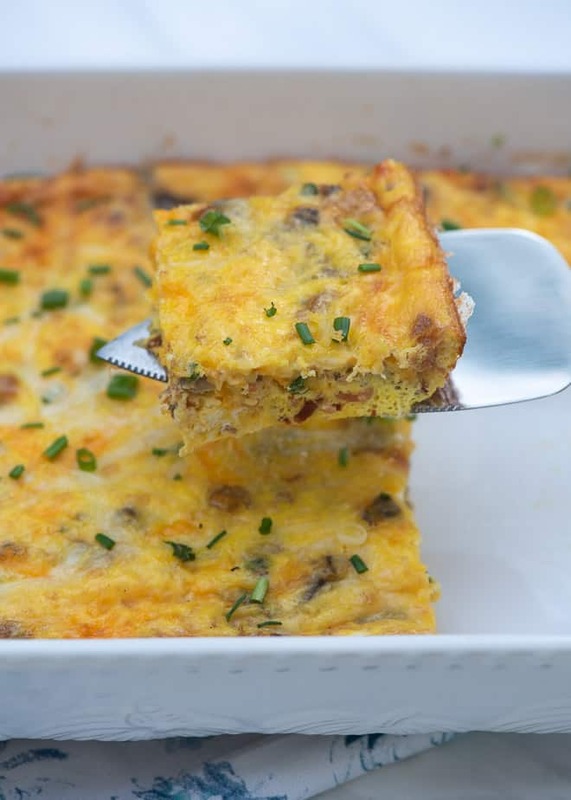 It seriously doesn’t get any easier than this Easy Crustless Quiche Bake. It takes minutes to assemble and can be made ahead if you’d like. But, honestly, it’s a breeze to assemble this dish the morning of your brunch, especially if you’ve cooked your bacon the day before. 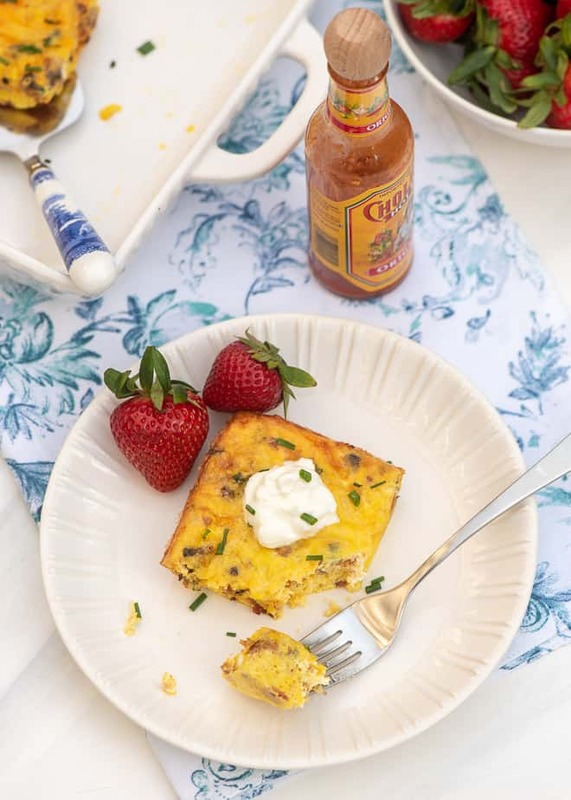 An added bonus for me is that it’s lighter than traditional quiche because there is no crust and it calls for light or regular sour cream instead of the half-and-half or heavy cream you see in most quiche recipes. It’s also mighty versatile, super kid-friendly, and a real crowd-pleaser. 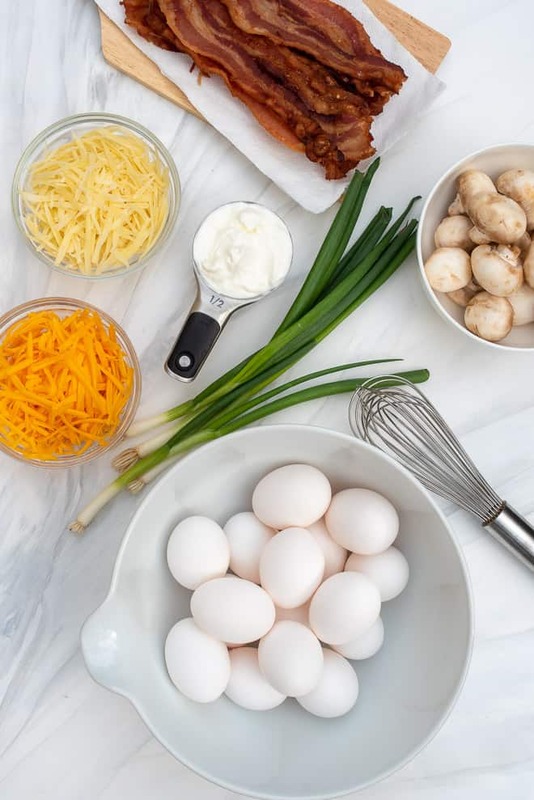 The ingredient list is short and sweet – eggs, light or regular sour cream, green onions, sharp cheddar and Gruyère cheese, bacon, and mushrooms. You’ll also need a little all-purpose seasoning, like Lawry’s Seasoned Salt. I prefer Gruyère when baking quiche over the other type of Swiss we all use on our sandwiches – you know, the one with the holes. It is a fabulous melting cheese with a distinctive and entirely delicious rich, nutty and slightly sweet flavor. It’s a bit pricier but I feel it’s worth it, especially on the holidays. You can absolutely substitute a lower cost shredded Swiss if you’d like. I can hear some of you saying “ugh, we hate mushrooms” or can I add more veggies?”. Yes! 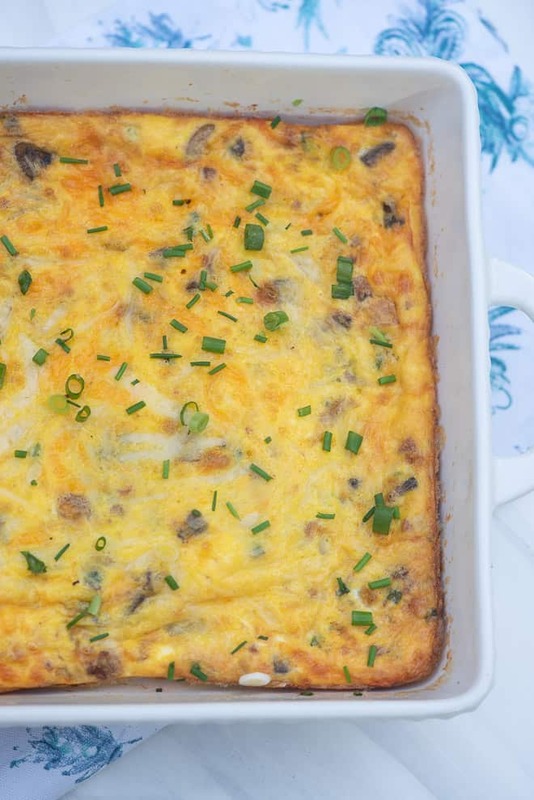 This versatile recipe would be delicious with a variety of different veggies. Some that come to mind are asparagus and bell pepper. 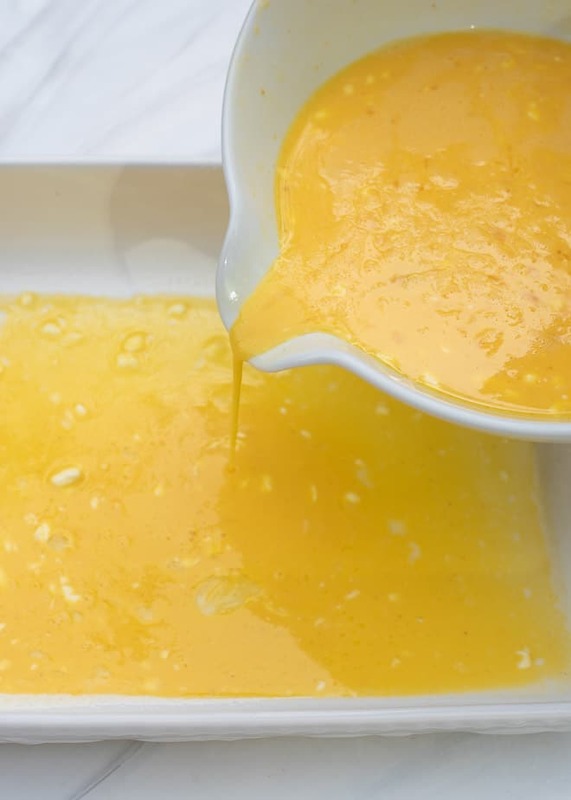 Just be sure you sautè them lightly to draw some of the moisture out and soften them a bit before adding them to the egg mixture. You can also swap the bacon with about 1 cup chopped, fully-cooked ham if you’d like. I’ve done this and it is wonderful and especially convenient if you’ve got leftover holiday ham on your hands. 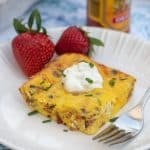 Start by whisking the eggs with the sour cream and all-purpose seasoning. Transfer the mixture to a lightly greased 13-inch x 9-inch baking dish. See my instructions on the recipe card below for roasting your bacon in the oven. This is by far and away the cleanest, easiest method for cooking an entire pound of bacon all at once. 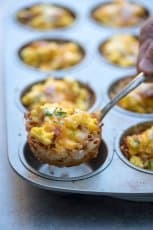 Check out The Kitchn for great instructions and a video tutorial on How to Make Perfect Bacon in the Oven. 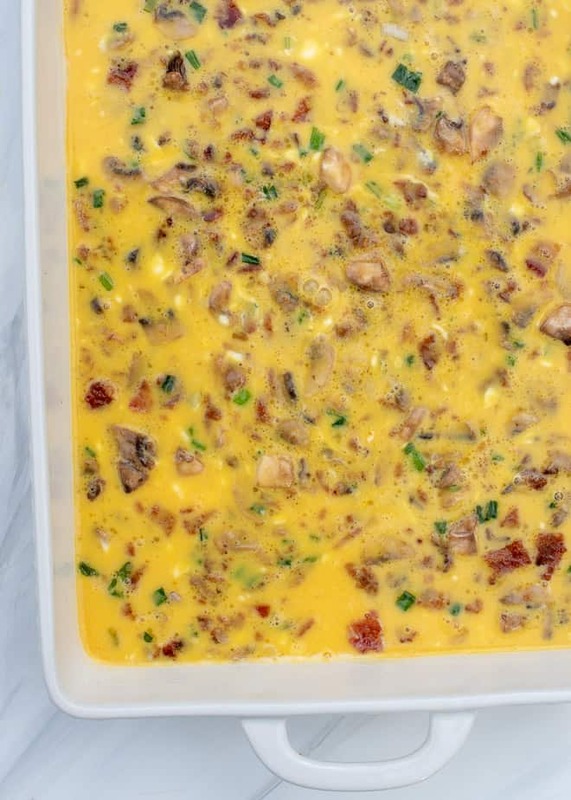 Once your bacon is cooked, crumble it into a mixture of lightly sautèed mushrooms and green onions and spoon it over the egg mixture. If you want to assemble the dish in advance, stop here. Cover the dish with plastic wrap and refrigerate it overnight. Next, you’ll sprinkle the cheese over the top and that is it, my friends! It’s ready for the oven. If the dish has been refrigerated, be sure to allow for a little extra time in the oven. 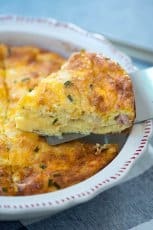 I garnished mine with both green onions and chives but go with what you like or what you have on hand. 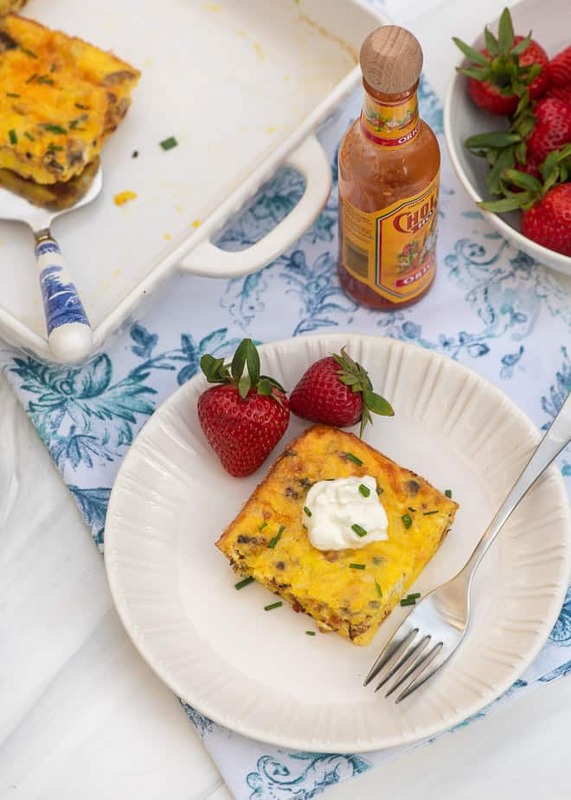 I love recipes that are baked in 13-inch x 9-inch dishes for serving a crowd. 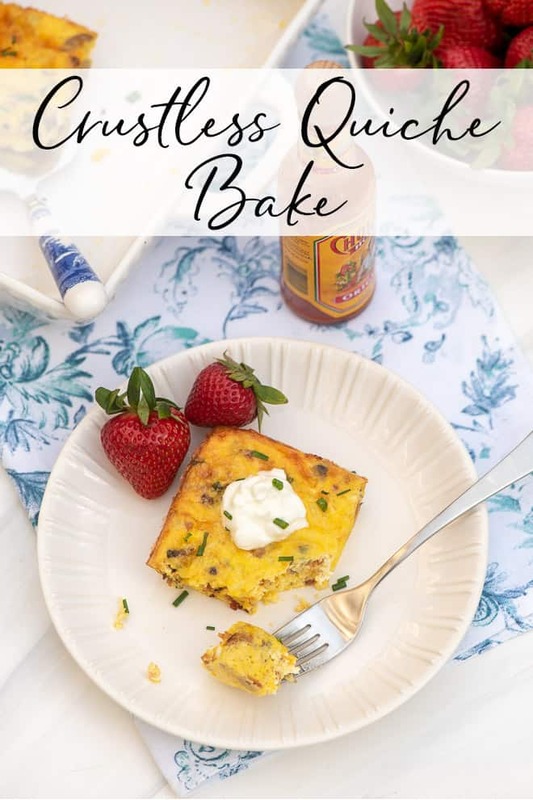 This Easy Crustless Quiche Bake is easy to transport and serves 12 when included in a brunch menu along with other items. Set out sour cream and hot sauce and step back! Line a rimmed baking sheet with foil. Place the bacon on the foil-lined baking sheet and transfer to the preheated oven. Roast the bacon for 15 minutes or until nicely crisped. Remove from the oven and use tongs to transfer the bacon to a double layer of paper towels to drain. Add the butter to a 12-inch skillet and place over MEDIUM-LOW heat. Add the mushrooms and sautè for several minutes to soften. Add about half of the green onions, reserving the rest for later. Sautè for another minute or two and then remove the skillet from the heat. Crumble the bacon into the skillet the stir to combine the mixture. Coat a 13-inch x 9-inch baking dish with non-stick cooking spray. Crack the eggs into a large bowl and whisk, lightly. Add the sour cream and all-purpose seasoning and whisk again until well combined. Don't be concerned if some small bits of sour cream do not fully incorporate. Pour the egg mixture into the prepared baking dish. Spoon the bacon mixture over the top. If you are making the dish in advance, cover it with plastic wrap and transfer it to the refrigerator to chill overnight. When ready to bake, set the dish on the counter while you preheat your oven. 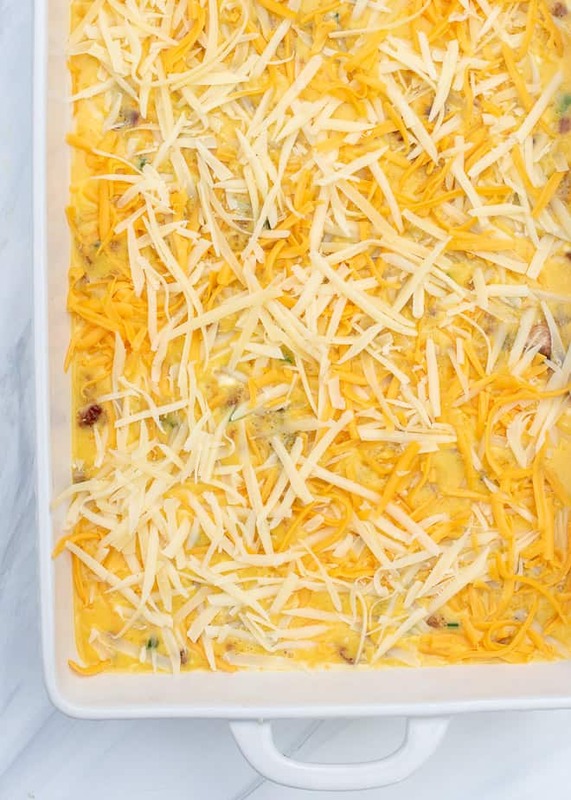 Sprinkle cheese over top and bake, uncovered, for 25 to 30 minutes (add 5 to 10 minutes if chilled), or until the mixture appears to be set in the center and the top is nicely browned. Remove from the oven and top with remaining green onions and/or chives. Let it rest for 5 minute before slicing. Set out sour cream and hot sauce for serving.